We manufacture and supply wide range of Ultrasonic Sm 250 US. We also export these quality products to other countries. These machines are vailable at competitive prices to our clients. There are in all 3 cycles of operation in the Ultrasonic Cleaning Tanks, Water In, in which the water starts flowing in the tank for a preset time. Second one is Ultrasonic, in which the objects are cleaned by ultrasonic cavitation. Thirdly, Ultrasonic with Swinging, in which the basket containing the objects starts swinging in the ultrasonic tank and are thoroughly cleaned by dual action of ultrasonic cavitation and swinging movements. 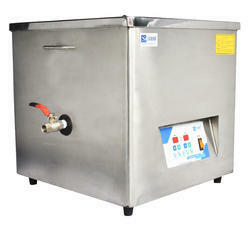 Looking for Ultrasonic Cleaning Tanks ?